Competition between IP address suppliers? US government to adopt IPv6 by mid-2008? 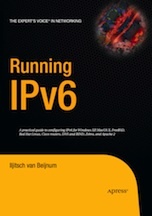 Best IPv6 wishes for 2013! When do we turn off IPv4? → 7059 is my new favorite number! With North America out of IPv4, do we trade, translate or transition to IPv6? "Nothing in BGP looks like it's melting"
What makes for an undeployable protocol? Apparently, SSL generates IPv4 "too bigs"